Welcome to 'Smashing Saturday' hosted here at Call Me Crazy! I wanted to create a fun way for everyone to share their journals, pages and ideas for everything SMASH! Don't have a SMASH book? That's okay! You can make your own or even use a notebook! Don't know what a SMASH book is? 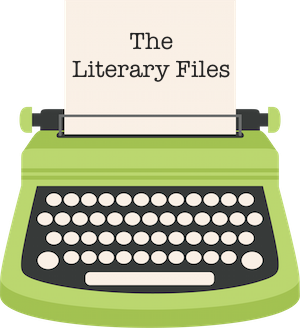 Make sure to link your Smashing Saturday post in the linky-widget down below! I can't wait to see all of your creations! For the longest time I had absolutely no idea what washi tape was, but I kept hearing people talk about how awesome it was. When I finally did understand the greatness of everything Washi, I had no idea where to buy it. 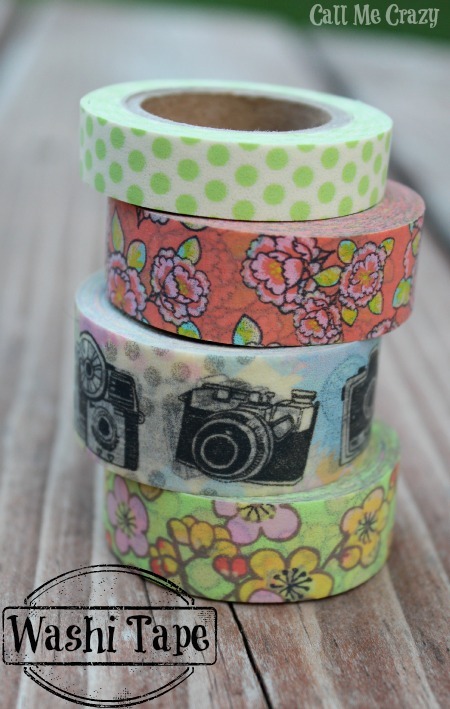 Luckily, soon after my discovery, craft stores (Micheals, JoAnn, Archiver's) started carry a ton of Washi Tape- yay! I just think it adds the perfect touch to a page and it's super easy to add, just peel and stick. Basically, washi tape is decorative tape. It comes in all different patterns, colors and widths. It has more of a matte finish (not shiney), isn't too thick and is soft, kind of like masking tape. It can (at least to me) get a little expensive, but I try to only buy it when it's on sale. Sometimes it comes in packs of two or three, which is great! All of the washi tape can be (usally) found at Micheals and most of it is from the company Recollections. In all the Micheal's I've been too, there's a whole display on the end of an aisle near the scrapbooking/stamping section. I have a drawer in my hot pink tackle box that's full of different decorative tapes I use in my Smash Journal. 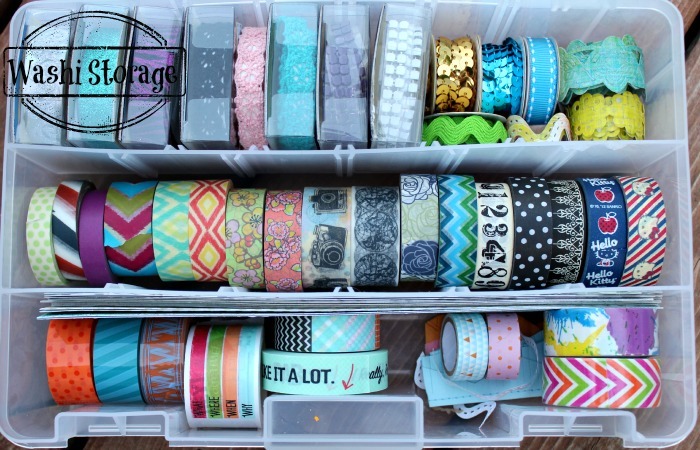 If were being technical, the middle row is all washi tape and then there's a few in the middle of the bottom row. The other's are glitter, crochet, sequin, paper, duct tape and tape that's more like scotch tape but still has a washi-like pattern. Now onto how I incorporate washi tape in my Smash Journal! I was planning on only showing you all the page I did this week that I used washi tape on, but I figured I'd show how I used washi tape on some of my past journal pages too! Here's one I did in early June. I just found the neon floral and antique camera washi tape earlier that day so I went a little crazy with it! I used it as a border on the inside and bottom of the page. I really wanted to show off the cameras on the one tape so I put it in a quite a few places and I think it also helped tie the page together as well. I just left the bottom right corner empty so I could fill it with washi tape. Below are three pages from my Smash journal. The top left and bottom right are the same page. 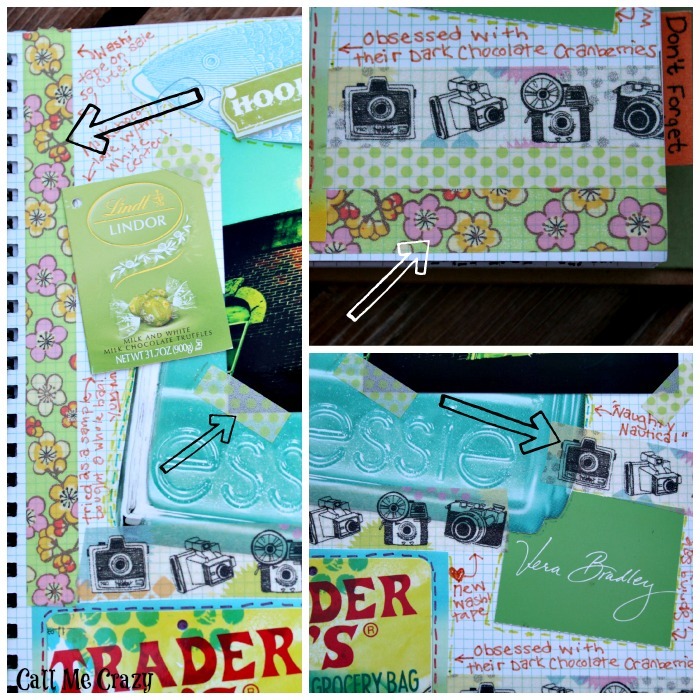 I just used this darling blue, green and white rose washi tape on the corners of the photos. I love how it brings out the green in the leaves and kind of matches the map letters in 'May'. Next one in the right corner I only used a small piece to just add a little something. It matches the white and green polka dot arrow I had so I couldn't resist! Just the littlest bit of washi tape does wonders! One of my favorite uses for washi tape it putting it down the side of a page. A lot of times if I'm doing a two page layout, I'll put it on both edges of the pages so you know they are one day. Here is my Smash page that I did this week! On this page I smashed one of the piece of mixed media art I made this week. I originally planned on just putting a picture of the entire canvas, but then I decided on putting just little peaks at it. I really like the close up looks of it and it's something different than what I usually do with my art pieces. I wanted to try using washi tape as a background border for my photos to help them pop from the page. This was the first time I tried this and I'm pretty happy with the results! 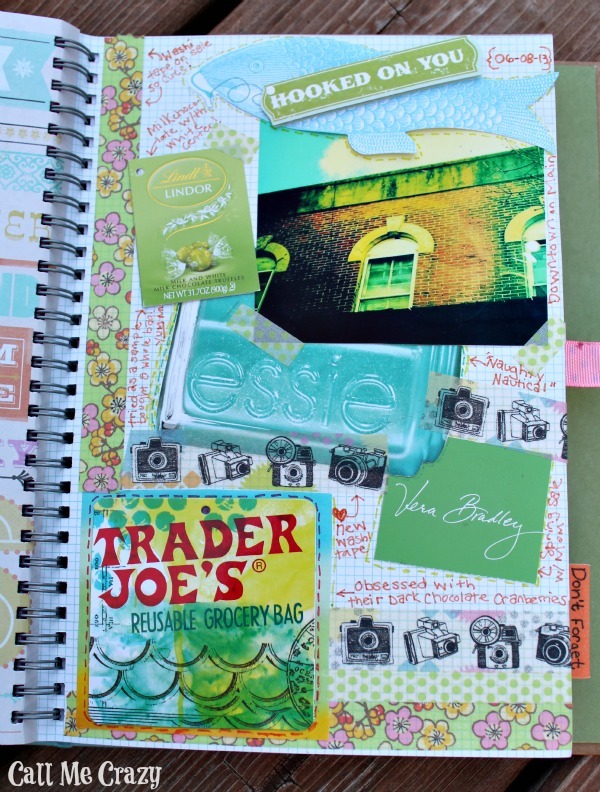 I also placed it in both of the page's corners- I just couldn't get enough of the pretty tape! I recently picked it up at the store and wanted to use it as soon as I could! Here's a list of some of the supplies I used in my above layout. The links are to Amazon (except the pen/marker- that's Staples), but I bought everything from my local craft stores (the prices are usually better!) Amazon has the Smash Journal listed for $5 though!! That's a great deal! July 13th: Day in the Life - Smash just one day- only photos, objects, etc. from a single day in your life. July 20th: Collage Love - Collage two pages with photos, quotes, buttons, etc. July 27th: Color Coded - Just pick one color and do a page using only that color in stickers, photos, etc. 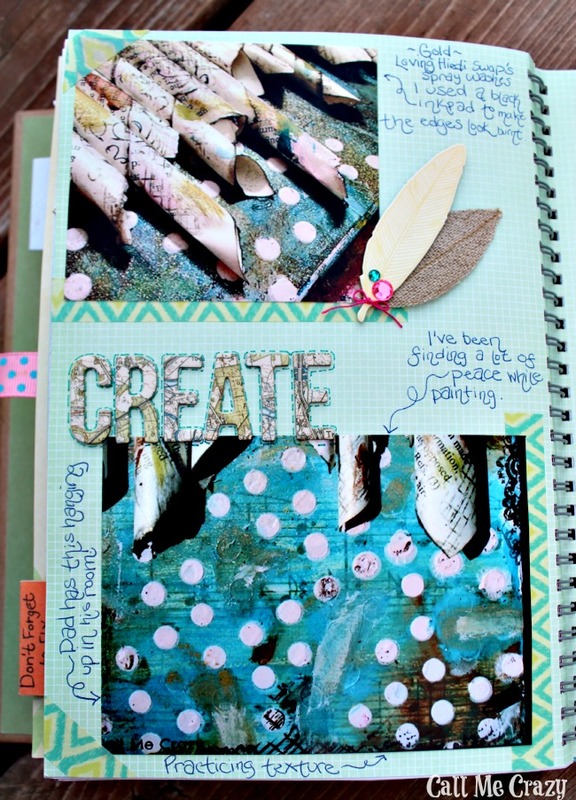 August 3rd: Journal It - Incorporate journaling in your design. Whether it's on a piece of paper or directly on the page, just write! August 10th: The Great Outdoors - Takes some pictures outside. It can be anything from flowers to animals or really just whatever you can find! The above is totally optional, but I know sometimes that I get in a rut and don't smash for weeks at a time. What helps me keep going is having a 'theme' to smash! Whether it's my dog, my favorite color or just flowers in my backyard, having a topic to smash helps me get started. I wrote what I'll be smashing and posting for the next five Saturdays. Feel free to join in on that week's theme, but you definitely don't have to, it's just an option! Anything Smash goes in Smashing Saturday! Have any ideas for an upcoming theme? 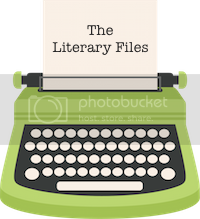 Leave a comment with your Smashing Saturday theme and I'll give you credit by linking to your blog! 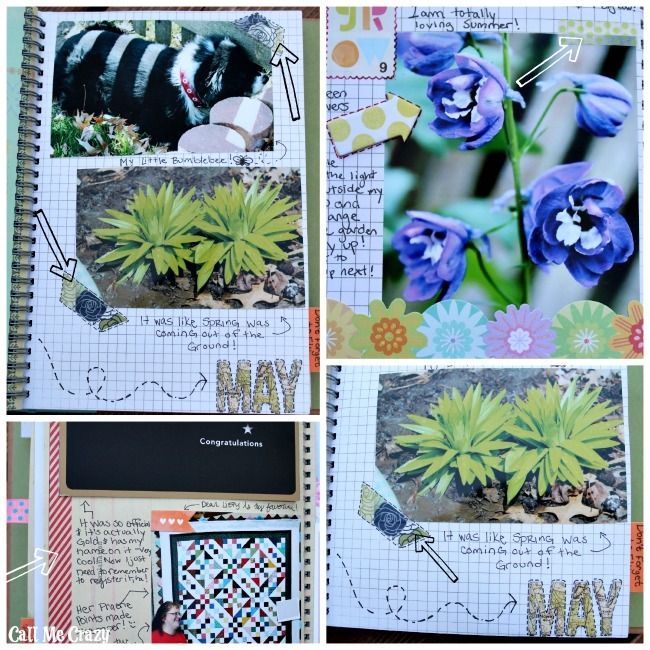 Check back next Saturday for some 'Day in the Life' Smash Journaling! That's awesome! Your collection sounds amazing and cute too! Can't wait to hear what you find at micheals and Joann! Love it. Love washi tape. LOVE vintage cameras. Where did you find that one? I am loving your smash book. I just started and I am OBSESSED to say the least. I like how you are so organized (I need your power and dedication). I've seen a lot of washi tape around, but I never saw the point- now that I see how cute all your pages look, I may have to go buy some pronto! Thanks for sharing, once I get my computer I can't wait to join Smashing Saturdays.